I offer a range of exciting geography talks that span human and physical geography. I have spent over 25 years travelling the world studying geography and how it has shaped us and our planet and affected our understanding. I am a geologist who has taught environmental science at university level for many years. I combine this with a passion for communication, and an enthusiasm for exciting audiences about my subject. In my wide ranging and entertaining geographical talks, I broaden horizons and provide thought provoking insights. Click on a talk to find out more. In 1995 I spent over two months on this island on a wild animal conservation survey. Halfway through, the long dormant volcano decided to awake. The excitement of catching wild animals day and night is overshadowed by the disruption caused by the volcano. I present an eye witness account of the first, evacuation triggering, eruption and how people coped subsequently. This talk looks not just at the development of a new volcano and its impacts on the environment, but also how it affected local people. 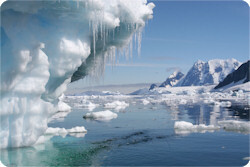 Antarctic environmental science has loomed large in my professional life. Ozone depletion, climate change and plate tectonics have all given up secrets to scientists studying in one of the harshest environments in the world. Here I explore Antarctica with world class environmental scientists and look at why it is so important to our understanding of the planet and what the future might hold. In Iceland geological and geographical processes that have shaped the planet are clearly on display. Plate tectonics, geothermal energy, glaciation, natural hazards, impacts and adaptations to natural disaster are all evidenced. The closest wilderness to Europe, abundant volcanism has created an alien planet-like wilderness where no land should be. 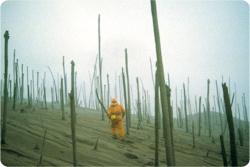 this volcanic force is still shaping and influencing the country and the talk looks at various examples, and also visits Heimaey the 'Pompeii of the North', which was nearly destroyed in the 1973 eruption. 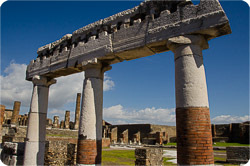 Using my expertise as a guide to Pompeii, Herculaneum and Vesuvius, I look at the geography of this volcanically active area and at the eruption history of Vesuvius. The Bay of Naples area is one of the most densely populated, and threatened, areas of Europe. 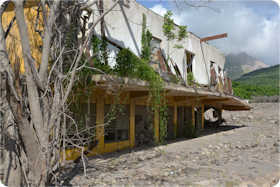 It's crucial tourism industry thrives thanks to the volcanic sites but 600,000 people could be affected by the next eruption. 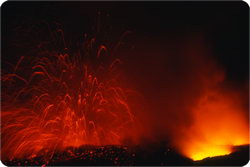 Mt Etna is Europe's highest active volcano and continuously active. 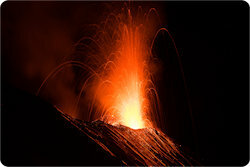 The Aeolian Islands to the north of Sicily include Stromboli whose continual activity has been used as a nighttime sailing beacon for over 2,000 years. 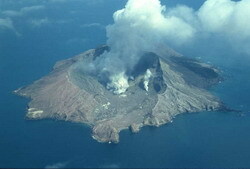 Other islands in the group have varying volcanic histories. This talk explores the culture and geological history of a fascinating and beautiful area. 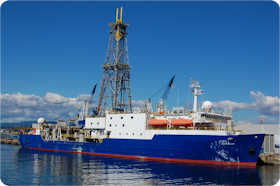 I have been an expedition participant on the marine research ship JOIDES Resolution in the Pacific. This is part of an amazing international research program that has helped uncover the secrets of tsunamis, plate tectonics, earthquakes and climate change by drilling through a hole in the bottom of the ship and into the seafloor. Come on board and learn what it's like to conduct scientific research, and support a self-contained floating community for months at a time, in one of the most difficult environments in the world. 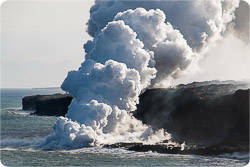 Volcanoes have fascinated me since before I went to university to study them. This new talk looks at volcanoes I have visited around the globe andI share some surprising insights and dramatic photography, and explain why volcanoes are so important, exciting, and relevant to understanding our world. 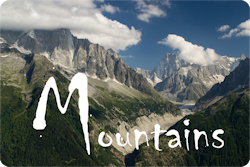 An exciting and stimulating talk for younger pupils on why mountains are so special and how they are climbed. I can bring my mountaineering equipment with me to make the session hands on and interactive. "I have spoken to many people since the talk and everyone was effusive in their praise for your presentation - I can't recollect such a positive reaction before. Like many, I rate your talk as one of the best if not the best in the 5 years I've being going to the RSGS. I'm sure you will have been aware of people's reaction - the volume of the applause at the end was a strong indication of how much they had enjoyed the experience." I joined a research expedition on the Integrated Ocean Drilling Program ship Joides Resolution, sailing from British Columbia. this international research project conducted plate tectonic research on the Pacific ocean floor. Learn more about the multimedia talk based on this here.